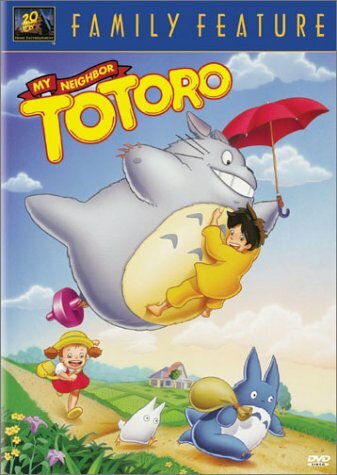 My Neighbor Totoro is that rare delight, a family film that appeals to children and adults alike. While their mother is in the hospital, 10-year-old Satsuki and 4-year-old Mei move into an old-fashioned house in the country with their professor father. At the foot of an enormous camphor tree, Mei discovers the nest of King Totoro, a giant forest spirit who resembles an enormous bunny rabbit. Mei and Satsuki learn that Totoro makes the trees grow, and when he flies over the countryside or roars in his thunderous voice, the winds blow. Totoro becomes the protector of the two sisters, watching over them when they wait for their father, and carrying them over the forests on an enchanted journey. When the children worry about their mother, Totoro sends them to visit her via a Catbus, a magical, multilegged creature with a grin the Cheshire Cat might envy. \n Unlike many cartoon children, Satsuki and Mei are neither smart-alecky nor cloyingly saccharine. They are credible kids: bright, energetic, silly, helpful, and occasionally impatient. Filmmaker Hayao Miyazaki makes the viewer believe the two sisters love each other in a way no American feature has ever achieved. "My Neighbor Totoro" is enormously popular in Japan, and some of the character merchandise has begun to appear in America. The film has also inspired a Japanese environmental group to buy a Totoro Forest preserve in the Saitama Prefecture, where Miyazaki's film is set. " --Charles Solomon"